The Hall is equipped to a high standard and is able to offer numerous hospitality features with excellent car parking facilities. Where can you get the best Breakfast in Somerset? Where can you get the best homemade cakes and pies in Somerset? 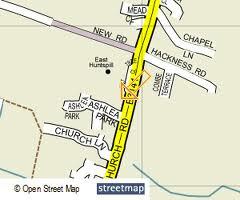 Where can you get the best bargains in Somerset? ​Where can you find a fruit and vegetable man and a van in the car park. Here at your own Flea Market. The best kept secret in Somerset. Open the second Saturday every month. Starting at 9 am and finishing at 12 noon. The second Friday of every month. Come and have some Bingo fun. Doors open 7 pm. We are looking to welcome new members to the club to enjoy a friendly games of bowls with a cup of tea to refresh you in mid session. It does not matter if you are a complete novice or an experienced player, old or young or in between, all are welcome. No woods necessary as the Club has several sets that can be used. Come along at the above times or contact Bryan or Lesley on 783444. 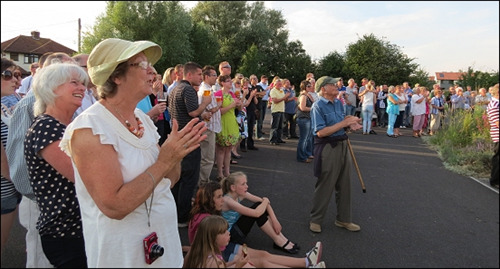 A commemorative clock was unveiled in memory of a popular East Huntspill Villager during a ceremony in front of hundreds of residents on Saturday Evening, 21st July at Music on the Green Event. The new digital clock was launched above the entrance to the village hall in memory of Ray Puddy, who died in January, and was known as the "Father of the Village Hall. Dave Barlow (committee member) said "If it hadn't been for Ray, this wonderful hall wouldn't be here today. He was the driving force behind getting it built which is why we wanted to do something special to remember him". Ray's widow, Mary, was among 500 residents, family and friends at the ceremony, which was held during Music on the Green, Mary said she was "deeply touched" by the support. which was sponsored by East Huntspill Parish Council and also sponsorship from Notaro. Villagers and Village Organisations all joined together for this event. and the Village Hall Committee, especially Eric & Sue Ganfield and Dave Barlow). We would like to thank all the above for all their hard work and everyone else involved for making this a memorable evening ..... perhaps this could be a regular yearly event? 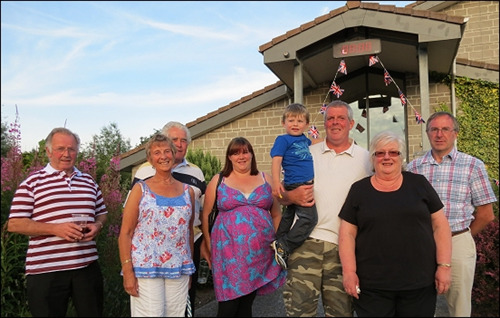 Who would have believed that in the early years of the 21st Century, 500 people would come together in a Somerset Village to celebrate not only The Diamond Jubilee, but also to remember a key resident. 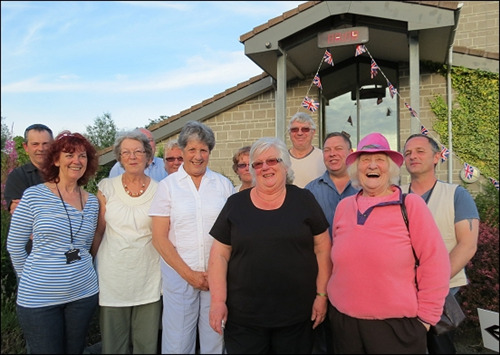 On the wonderful sunny evening of July 21st ast East Huntspill's very own Village Hall, Music on the Green took place - what an evening that was! With entertainment from The Kestrels Majorettes, Our for Tomorrow, The Talk Show Hosts, Old Mates and Hazy Daze - the 500 attendees were entertained with a fine selection of music that kept them all going until the late hours. 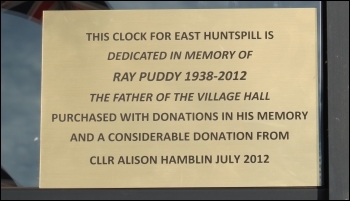 At 7.30 pm the official unveiling of the New Village Hall Clock in memory of the late Ray Puddy took place. Later on and for those who had not brought something to eat, 'Barnards' arrived to soak up some of the cider and beer offered at the onsite bar. Stalls representing All Saints Church, The Art & Gardening Club and the Est Huntspill Pavilion Project were in attendance to make this a truly united village event! The overall event was celebrated as a great success with village residents posting positive comments on Facebook in addition to shaking the hands in appreciation to some of the event's organisers. Thanks go to the sponsors, namely East Huntspill Parish Council, Notaro Windows, Brandon Tool Hire, The VitalSign Company and of course the East Huntspill Village Hall Trust. An immense expression of gratitude goes to Eric and Sue Ganfield, Dave and Sally Barlow, Marion Watts, Sue Wall, Parish Councillors Liz Birt and Rob Prowton, the Puddy Family and of course all those who attended without whose help, the event would not have happened.